I've been back for two weeks now after spending a month in Kassel participating in the Maybe Education program at the Documenta 13. I will post still a few pictures from Kassel once I have the time ( I’ve been spending hours trying to clean up my computer which is having more mini breakdowns than me). I've been having a rough few weeks. It is partly because of the seasons changing which tends to bring an onslaught of melancholy my way, but more so it is that my heart is a little broken, my money is running out and I am feeling completely lost and confused as to the direction my life is supposed to be going. This last point has to do with the fact that I have only a thesis (which also adds to my stress) left to finish and then I am done with my course here in Milan, I am kind of wondering what I am supposed to do when I am done. It is hard to believe that 2 years is almost over. All of this makes me feel all very lonely. I’ve been treating this depression in my usual way; I drink too much tea and either starve myself or eat too much sugar. I then follow on this by breaking out in tears randomly in inappropriate places such as on the metro, in the supermarket or the elevator on my way to pay my landlady. Furthermore I make sure that I call my friends often to prevent myself from slipping into that dark place where I will eat only two frankfurters a day and listen to Phantom of the Opera too many times. Thank heavens for my friends; they are the best bunch a girl could ask for. If it wasn’t for those drinks at Cape Town (which is a great bar in Milan not the city in South Africa) or our dinners where we cook together, I think I would definitely be lost here. So Friday on my way to the supermarket while I was having one of those sidewalk-weeping sessions I discovered this giant leaf on the sidewalk. Today I picked up an even bigger one. So of course you might think that this story has no point, but picking up this giant leaf that’s width is the same as my shoulder width, reminded me of noticing things. Too often we get so stuck in the rut that we forget to count our blessings and see where we are at. 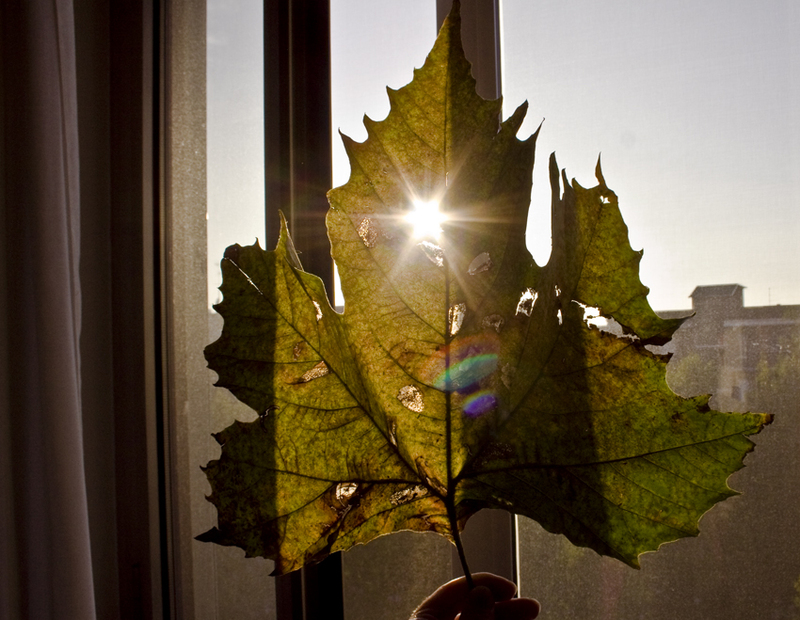 So I took this giant leaf and hung it up in my room, as a reminder that one needs to get up and go out to discover treasures, it is better to put on your shoes and coat and cry in the street, then sit alone in a room, who knows there might be even bigger leaves out there. Yes these things in life is like my path to the supermarket, it can seem so mundane, and sometimes I have to walk it while crying, or dodging footballs, but it is only by walking it that one notices the treasures and that one gets to the chocolate shelf.